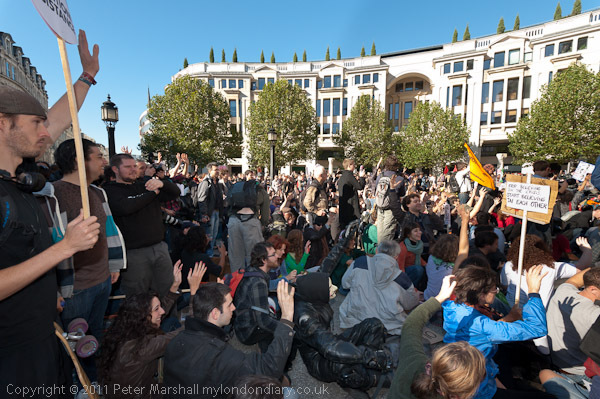 Occupy London celebrated their first anniversary yesterday, a couple of days earlier. One of the events we were all invited to was a special Evensong in St Paul’s Cathedral today, and I didn’t pick up the hint, but it made the news tonight after four young women from the movement chained themselves to the pulpit. I was with Occupy yesterday for their celebrations, but perhaps I’ll write more about that event when I finally get around to putting it on My London Diary. A year ago I was with them when a meeting on Westminster Bridge took the decision to occupy the Stock Exchange, and was with them again when they were locked out and ended up at St Paul’s the following Saturday. 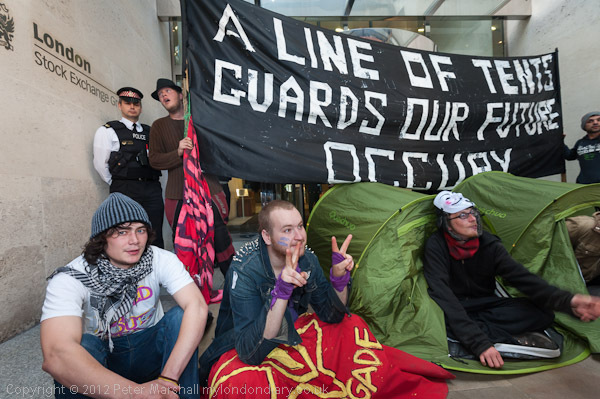 I visited Occupy at St Paul’s on a number of occasions, both for special events and also during normal days there, and also the Occupy Finsbury Square site at the north of the city, but didn’t get involved in the movement, careful to attend as an observer rather than taking part. When they were moving out I got an urgent phone text message to come and take pictures, but was unfortunately on a hillside in Derbyshire. 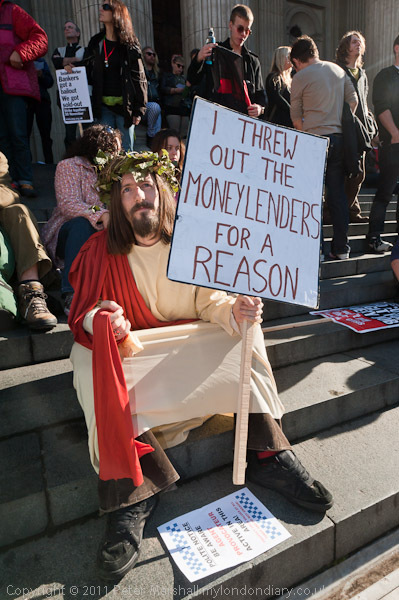 But I was there on May Day this year when a few from Occupy London did finally make it to the Stock Exchange and staged a token occupation in its doorway for a few hours. So I was pleased to be at St Paul’s again, on the steps outside on Saturday for the anniversary event and to be handed a free copy of ‘The Little Book of Ideas‘ written by Occupy London’s Economics Working Group, which claims to explain in simple English many of those confusing economic terms like ‘quantitative easing’, ‘derivatives’ and ‘LIBOR’. Occupy hasn’t come to an end, even if the initial occupations have ended, the movement has changed the way people think and given new insights into economics and society, in particular to the varied ways in which the rich in society have screwed the poor. Along with movements such as UK Uncut they have changed perceptions and changed the political debate. This entry was posted on Sunday, October 14th, 2012 at 08:38 pm and is filed under My Own Work, Political Issues. You can follow any responses to this entry through the RSS 2.0 feed. You can leave a response, or trackback from your own site.